A handful of companies installing a 3-megawatt project for the Institute of Concentration Photovoltaic Systems in Spain have formed a new industry association. One of its first goals is to draw up standards for measuring the performance of their systems. Companies involved in a 3-megawatt concentrating-photovoltaic project in Spain have formed a new consortium to support the technology. The group's launch came the same day as SolFocus announced it has completed its first commercial project for the Institute of Concentration Photovoltaic Systems, also known as ISFOC. SolFocus and other companies involved in the project, including Concentrix Solar, Emcore Corp., ISFOC and Isofoton, are the founding members of the group to back technology that uses mirrors or lenses to magnify sunlight and direct it onto solar cells, potentially cutting costs. Nancy Hartsoch, vice president of marketing for SolFocus, said the formation of the CPV Consortium is another sign that the industry for concentrating photovoltaics, or CPV, is maturing. 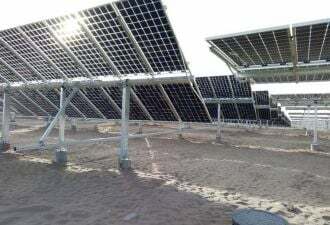 "It is crucial for the companies participating in the CPV industry to collaborate and ensure that this technology meets and exceeds the cost and performance requirements of the global energy market," said David Danzilio, vice president and general manager for Emcore's Space and Terrestrial Solar Products, in a written statement. The group already has seen interest from beyond CPV manufacturers, such as from plastic and solar-cell manufacturers, Hartsoch said. The membership is open to the whole supply chain, including mirror and lens providers, companies with technology to enable concentrators to track the sun and any other institutions with "a vested interest" in advancing the CPV industry, she added. "Finally, after many years of promising and being lab experiments, [concentrating] PV is ready to deploy, but we need to be sure the infrastructure is there and the performance standards and installation regulations are in place," she said. "Everyone's kind of seeing the momentum and drive, seeing things finally come to fruition, and they want to be as close as possible to suppliers and want to be sure everything they need in place is there." For one thing, the group plans to set standards for measuring performance of CPV, Hartsoch said. Take efficiency measurements, for example. "People measure it every which way," she said. "Some talk about panel efficiency, some talk about system efficiency, and some will only talk about [a mirror or lens]. It can be very confusing to developers trying to figure out 'How much energy do I get at the end of the day?' We will work to figure out standards so they can compare apples to apples." The consortium also wants to make sure they aren't held to standards for traditional flat-plate panels that aren't applicable to CPV, she said. "Now we've got an industry organization that's going to make sure we don't stumble, that when we're talking about performance, we're all talking the same language," she said. While CPV companies have met some milestones, including raising funding and constructing small projects, the technology makes up a miniscule part of the market today and some analysts remain skeptical about whether that will change. Analysts from Greentech Media and the Prometheus Institute expect the market to reach about 6 gigawatts by 2020, accounting for about 2 percent of the solar market, according to a report released in April. Earlier this month, Eric Wesoff, a senior analyst at Greentech Media, predicted that only three of some 25 venture-backed CPV companies would ultimately succeed.